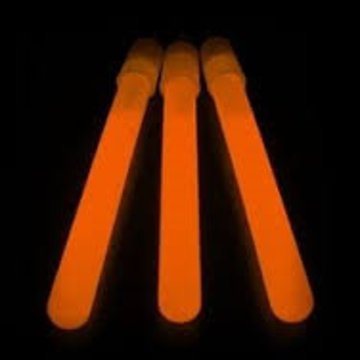 Our Premium 4 inch ORANGE light sticks are brightly colored when activated and last from 8 to 12 hours. Even known to last longer. Includes loop hole for attaching string so you can hang it around your neck. These glow sticks are excellent for storage in case of an emergency and are great to have on hand in your automobile. The glow sticks are easily activated just by bending them until they snap. Shake the glow stick until it is fully lit and it's ready for use. The glow sticks sell great at pretty much any night-time or indoor event. You can use the glow sticks as fund-raisers, for your booster organization, school dances and sporting events. Glow sticks make a great item at concession stands.